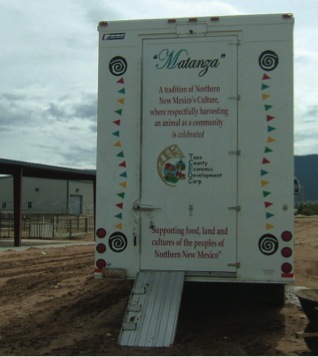 The Taos County Economic Development Center‘s (TCEDC) innovative food projects have made use of the unique cultural and environmental attributes of the traditionally agricultural Northern New Mexico region to advance toward community food security. 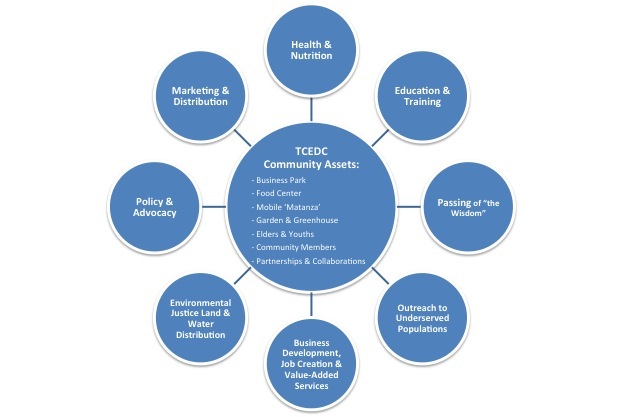 TCEDC envisioned a comprehensive community food model that extends from the logistics of slaughtering livestock for farmers to product placement and nutrition educational outreach for underserved populations. The Mobile Matanza, a USDA-certified slaughtering truck that gives limited-resource farmers access to the elements necessary for their goods to reach commercial markets, is among TCEDC’s palette of tools. Ranchers, local farmers and producers of value-added products from TCEDC’s Food Center also have the opportunity to participate in TCEDC’s innovative packaging and labeling program. Our goal is to increase income to limited resource ranchers and farmers through participation in TCEDC’s “OSO GOOD FOODS”™ cause marketing program.